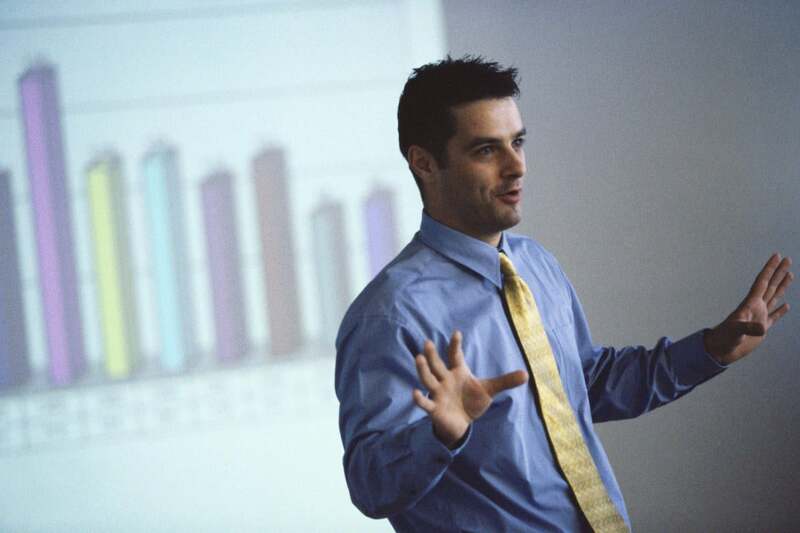 Understanding the roles you play when giving a business presentation. We have all heard it said: when it comes to giving a business presentation, you should just be yourself. Don’t try to be someone else. The idea that you should just be yourself is usually offered as an antidote to nerves. Don’t be nervous, just go out there and be yourself. “Be yourself” is code for "just relax." But my advice to anyone giving a business presentation is, don’t just try to be yourself. Be better than yourself. Don’t try to be someone other than yourself. Be your best possible self. A business presentation is a professional event. Rise to the occasion. Don’t settle for an informal, easygoing, and largely improvised version of yourself-trying-hard-to-relax. Face the audience. Stand up straight. Take a deep breath. Open your mouth. Look them in the eye and speak with distinction. Bring your best game. It is also important to remember that when you are giving a presentation you are playing a role. A successful presentation depends on a clear understanding of your role. Your job is to provide useful information that your audience needs to make decisions. Your objective is to reach your audience, transform their thinking and move them to action. But there are three basic roles that presenters take to accomplish the objective and the job at hand. The three basic roles are actor, director and narrator. In a business presentation, actors are not playing characters or persons other than themselves. An actor is an active agent in the events that are described in the presentation. The actor has physical presence and a direct and personal interest in the execution of events. The actor is attempting to engage the audience as fellow actors. If you are seeking approval or support from the audience for a new strategy or business initiative on behalf of your company, department or team, then your role is likely that of an actor. The orientation of the actor is, “We need…” or “I want…” to get things done, and I need your understanding if not your actual help. A director is not an active agent in the execution of the events described in the presentation. But the director has a unifying vision for how the action needs to unfold if it is to be successful. The director takes responsibility for seeing that the right actors are identified and engaged, that they all have complementary objectives, and that they are actively coordinating their efforts. If you are an internal consultant or are presenting a new operating plan to one of your departments you are likely assuming the role of a director. The director is empathetic and supportive of the actors, but also sets high expectations and standards. The general orientation of a director is, “You need…” to be doing the following things in order to do your jobs and meet the objectives as defined. The third basic role is that of a narrator. The narrator is an objective observer, with special insight and no other agenda than the truth. The narrator may have played an active role in the past, but is now describing or interpreting events and the actions of others with the benefit of perspective and hindsight. The general orientation is, “this is what other people are doing or have done in the past.” If you are presenting market research or a competitive analysis you are likely assuming the role of a narrator. Decide which role is most appropriate to the presentation you are giving and then fully commit yourself to that role. Don’t allow the audience to become confused as to what your role is. If you are an actor then demonstrate a little passion, a bias for action and a sense of urgency. If you are a director then you must have an inspiring vision and take responsibility for the efforts of everyone in the pursuit of that vision. If you are a narrator, the audience must know that you have depth of insight, clear judgement and their best interests at heart. This flow creates momentum toward action. The presenter becomes engaged and assumes an active role over the course of the presentation which a) lends credibility to everything they just said as a narrator and b) inspires the audience to follow their example. Actors and directors are perceived to hold a bias which makes it harder for them to quick change and assume the role of a wholly objective narrator. There is security in knowing your role and what it is you need to do. Understanding and embracing a role gives you confidence. You are able to address and engage the audience with a distinctive and consistent voice. With confidence comes the right amount and kind of relaxation. When the audience recognizes a familiar role, they too are able to relax. The role places information in context, the message becomes clearer and the audience becomes more receptive to the message. So more than knowing yourself and just being yourself, the path to success in the business presentation is made straight when you know your role and play that role with energy and conviction.